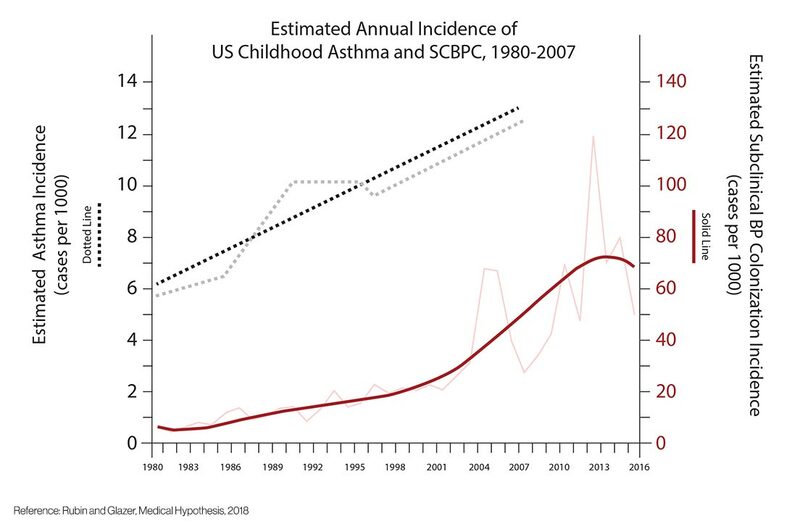 Rates of allergic diseases such as asthma have escalated dramatically over the last several decades in the US, paralleling the surge in B. pertussis infections, particularly since the transition to the less potent acellular pertussis vaccine in the 1990s. ILiAD is working with leading scientists in the field to investigate the relationship between B. Pertussis and allergic disease. Cross-sectional illustration of the human head demonstrating B. pertussis inhalation and localization to the back of the throat, adjacent to pollen. In collaboration with the Institut Pasteur de Lille, ILiAD is investigating the potential for ILiAD drug candidates to prevent Asthma. As illustrated above, one potential mechanism that can lead to allergic disease is when aerosolized B. pertussis from a B. pertussis-infected person is inhaled into the nose and may attach to ciliated respiratory epithelium along the nasopharyngeal path of airflow. Pollen may follow a similar inhaled path and co-localize with B. pertussis which secretes pertussis toxin. As B. pertussis and pertussis toxin are potent adjuvants, co-localization of B. pertussis and pollen potentially induce adjuvant-mediated host sensitization to pollen, including activation of antigen presenting cells, leading to host sensitization. BPZE1 holds the potential to eliminate B. pertussis colonization, potentially reducing the burden of multiple important human diseases, caused by allergic sensitization. Decades of research links pertussis toxin with multiple allergies to common environmental agents such as pollen, dust mite and gluten. With the recent discovery that subclinical B. pertussis colonization persists around the world, even in highly vaccinated communities, ILiAD is investigating the relationship between B. pertussis colonization and asthma, atopic dermatitis, and other allergic diseases.